Woke up to the sound of rain pattering hard on my tent this morning. Had a little bit of cell service for the first time in a couple of days, so I laid in my tent and waited for the rain to slow down before packing up. Rained on and off for most of the morning, which turned the trail into a muddy, sludgy mess. Slowed me down pretty significantly, but I had town on my mind which helped me keep the pace. Sun took over for most of the afternoon, but the threat of rain loomed large all around. Every couple of minutes I'd get spit on with a little shower, but it would soon pass and the sun would dry me off. Temperatures were in the low 40's, which meant it was too warm to wear a rain jacket for most of the day, but cold enough that even with a beanie I had to keep moving for fear of quickly chilling. Grand vistas and views abounded. Another day of stopping every couple of minutes to take a picture of the desert scenery. Sometimes a flowering cactus, others some desert flowers, always something to snap a picture of - it's absolutely beautiful out here. End of the day the rains hit pretty hard. I made it to a trail head with a covered picnic table. Had plans to spend some time at the trail angel's home in Tucson who drove me to the southern terminus, and unable to get a hitch, I ended up paying for a ride share. Surprisingly inexpensive and totally totally worth it, considering how bad the weather was and how far out of town I ended up needing a pickup from. Trail angel had dinner waiting for me, which was absolutely awesome. Ended up chatting for a couple of hours before everyone decided it was time to rack out. Definitely looking forward to resting up and taking a zero tomorrow. Relatively calm night last night. Caretaker at Kentucky Camp found me a spot with a natural windbreak, which cut down on the driving wind and rain that occurred throughout the night. Pretty impressed at how well my tent holds up considering how light it is, and the fact that it doesn't have any poles. Caretaker offered to drive me in to Sonita to pick up my package at the post office, as well as grab another day and a half of food. It was super awesome of him to do so, and is one of the main drivers of why the trail is so special - the kindness of strangers never ceases to amaze. Got back to the camp and packed up all my things that were getting some sun and air. Threw two hot pockets in the microwave and chatted with the caretaker for another hour before finally walking out into the desert. Didn't leave camp until around 1130, but you can't rush things out here - the trail isn't going anywhere, and organic experiences are what it's all about. The hiking today was incredibly scenic, overlooking valley upon valley of a tannish, yellowish grass, beautiful blue skies, and a backdrop of mountain ranges in the distance on all sides. Took all I had not to stop at the top of every hill and snap a few pictures, although that's pretty much what happened anyway. The way I figure, pictures don't weigh anything so why the hell not. Checked the weather when I managed to get a bit of cell service, winter storm warning for the next few days. Luckily I'm below the expected snow elevations for the time being, but plenty of rain is on the way. It's starting to patter gently on my tent as I write, here's to hoping it passes on, or is at least much less threatening than the weather report suggests. Might end up taking a day off here soon, get a day of rest before pushing out into the next range of mountains. Knee has been giving me grief as well, figured it's better to slow down and listen to it then injure myself and end this hike early. Slept like a rock last night, guess the walking is finally starting to catch up to me. Took it relatively slow this morning. Not because of the cold as was a day or two ago, but because my breakfast consisted of some rehydrated rice and cous cous that I didn't feel like trying to walk and eat at the same time. First half of the day was up. Nothing too severe, but the dry air and sun is still taking its toll on me, so the walking feels worse than it is at times. Second half of the day was pretty epic. The trail walks along an old mining operation for many miles and you can see the remnants actually still in place from the early 1900's, and the scenery itself was pretty amazing: nothing but desert prairies and an occasional butte for as far as the eye could see. Hit the prairies at the perfect time of day as well, with the late afternoon sunlight really doing its part to make everything gleam and sparkle in yellows and oranges. Made it a bit further than expected today, but it all worked out. Kentucky Camp is the last stop on the mining trail tour I walked all day, and is the original headquarters of the old mining operation, now owned by the forest service. The caretaker wasn't around when I arrived, but showed up shortly thereafter and we chatted for a good thirty minutes before he showed me the best place to camp that is secluded, out of the wind, and close to the pit toilets (huge win there 😉). Even let me use a staff kitchenette and microwave, which I gratefully accepted, using the microwave to heat up my cold soaked rice, which I also melted some cheese on. Appears there's some bad weather coming the next few days. Heading into Sonita tomorrow to grab a package, will have to see what the weather entails. If it looks too rough I might have to hunker down for a day or two, otherwise I'll push up trail to the town of Vail and check again there. Really tired tonight, here's to hoping I get some good sleep. Real cold night last night, definitely didn't expect that when I decided to come out and walk the AZT. Bit of freezing in my water bottles, and a thick coat of frost over the ground and my tent when I woke. It's never easy for me to get out of the bag when it's so cold, especially when the sun hasn't come up yet. Took quite some time to pack up, but when the sun finally crested the canyon I was sleeping in, it motivated me to move faster - if only because I could take frequent breaks to warm my hands in my pockets and my body in the sun. Slept about nine miles outside of the town of Patagonia, managed to get in before too long. Stopped at the first coffee shop I saw and snatched up a raspberry and cream cheese turnover and a large cup of coffee. Used the WiFi for a bit to check in with my wife and daughter, and relaxed for a bit. Wandered further into town before bumping into another hiker, asked a few pertinent questions about where he ate and what the resupply situation was, and wandered right into another coffee shop sort of place. Plugged in all my electronics and ordered a big ole salad with a medium rare cheeseburger patty thrown on top. Ate my salad and drank glass after glass of water as I uploaded a few journal entries to the site. Wandered further down the main drag of the town and found a food co-op, purchased a few things to fill me out for the next few days. I unfortunately will be heading back into town in a short span of time, have a replacement set of sunglasses lenses to pick up in Sonita that didn't arrive in time before I left home, so my wife shipped them to me on the trail. Left town and spent the rest of the day walking on arid, dirt forest service roads. Not the most spectacular day for walking, three of the miles into town were on pavement, and the seven out were on pavement and dirt roads, with about seven more tomorrow before linking back up with actual trail. If the limited hiking I've done has taught me anything though, it's to put your expectations aside and just enjoy whatever the trail throws at you, for better or for worse. Managed to find a small grassy plot aside a stream for the night, too good to pass up since grass has been so sparse since the start. The sky put on an incredible display tonight as the sun set. While I couldn't see the sun itself behind some hills, I ran up a steep canyon incline to get the best view I could, and was not disappointed. The sky appeared to be on fire with oranges and reds and purples. It's amazing how different the sunsets are depending on where you are in the world. Another solid day of walking. Overcast for most of the day, and a wind advisory as well. Kept the temperatures in the mid 50's, definitely not the hot desert weather I was expecting (but still nicer than three feet of snow!). Relatively mediocre walking for much of today. After the first couple of hours coming off the remnants of the peaks from yesterday, the majority of today's walk was on old dirt roads through cattle fields and thorough short and narrow canyons with no real views to speak of. Every couple of miles there'd be a glimpse of some rock features or hills way out in the distance, but between the colder temperatures and the high winds, it was a day for motoring. Ran into a couple of mountain bikers today, something I'm still getting used to. Many trails I’ve hiked on don’t allow biking on them, but the AZT is a multi-use trail with seemingly just as many people biking it as walking. Nothing wrong with it at all, I definitely see the appeal of biking in these environs! Ended the day a little early, although I managed to get further than I expected. Set up camp about an hour before sunset, which turned out to be a lucky break since a quick and dirty desert rain swept through shortly thereafter, dumping an incredible amount of water and disappearing just as quickly. Weather says it's going to be a cold one tonight, getting below 30 degrees Fahrenheit. Didn't think I'd have to sleep with my filter at all out here, guess I was wrong. Ten miles out from the town of Patagonia, looking forward to a bit of respite before pushing out back to the trail. What a night last night. Had trouble falling asleep, laid in my tent for over three hours before I was able to catch a few minutes of actual sleep. Kept waking up every twenty minutes or so, unable to truly get any meaningful shut eye. Around 0200 in the morning I woke up with a pounding headache, and shortly thereafter began vomiting outside of my tent. Luckily I had (apparently) already digested my dinner and any water, because all I was able to do was dry heave a couple of times. Attempted to drink some water and take some Motrin for my headache, only to throw that up a few minutes later. Attempted to sip on water since I wasn't able to sleep, but my stomach wanted nothing to do with it. 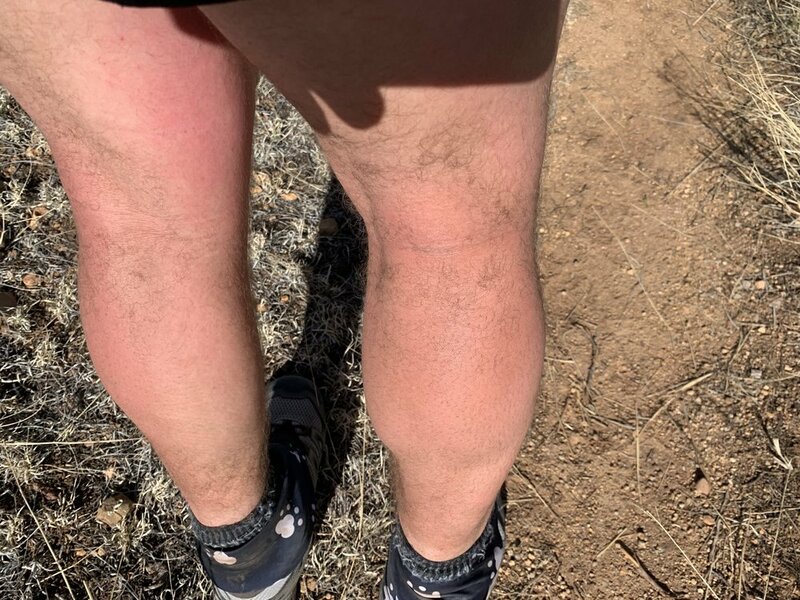 I'm pretty sure it was a combination of dehydration and altitude sickness, being that I live at 200 feet, spent less than 24 hours in Tucson at 2,000 feet, and was sleeping above 9,000 feet after a long hard day of hiking for the first time in months. Woke up with the sun and was a hot and woozy mess. Managed to pack up camp without forgetting anything, fill up my water, and ever so slowly trudge my way up the trail. Continually drank water all morning and I slowly began to feel well enough to eat some food. In combination with the overall trend of decreasing elevation, the water, and some light snacking, I slowly returned back to my (relatively) normal self. Beautiful day otherwise. As the old wives tale of Eskimo's having "hundreds of words for snow" goes, "desert" doesn't do this environment justice whatsoever. My favorite part about long distance hiking is the fact that you're literally walking through different biomes, and as you do you're able to watch them change subtlety with each step. Thirty miles to the town of Patagonia. First day on the AZT, did not disappoint. Woke up and packed all my things at the trail angel's home in Tucson, left after a small breakfast of espresso, eggs, and ham. Trail angel had a few errands to run before we left town, but soon enough we were on our way southeast. Stopped close to the trailhead to mail off the canvas bag I use when I fly to protect my gear to a friend's who lives in Phoenix, and we grabbed some Mexican food for lunch. Arrived at Montezuma Pass around noon. Took a few pictures, said our goodbye, and off I walked to the terminus. The AZT requires a small amount of backtracking to get to the terminus, approximately two trail miles. Not really a big deal, but it's a steep two miles down to the border, and effectively all uphill from the border back to the pass, and for the next six miles to the top of Miller peak. Definitely a ball buster of a first day. After returning from the border I yogi'd some water off the firefighters who were heading out for the day, and managed to climb uneventfully to the top of Miller before the sun was too low in the sky. I was rewarded with some an absolutely fantastic sunset. Not finding anywhere to camp because (surprisingly!) there was quite a bit of snow on the northern side of Miller, and finding myself only two miles from the next water source, I pushed on, arriving at the source and a relatively flat spot as it was getting dark. Set up camp, a bit slower than usual since it's been almost a year since I've done it, but even still managed to eat, settle in, watch a little TV, and start journaling in the bag. It's a beautiful trail, that is for damn sure. Reminds me a lot of the southern end of the PCT, which shouldn't be too surprising to anyone who's traveled in both parts of the country. Looking forward to seeing just what else this trail has to offer. Took a bus down to Portland, ME yesterday where a college friend of my wife's graciously put me up for the night. Said friend dropped me off at the airport bright and early this morning on her way to work, and off I went on my multitude of flights for the day. Flew from Maine to the Carolinas, up to Chicago, back down to Arizona. Ended up doing a big "W" across the country, but finally landed in Tucson at the end of the day. Grabbed a ride share to downtown Tucson from the airport and bought my first resupply at a local cooperative. Definitely bought too much food, don't think many hikers ever get their first resupply back on trail right. Walked down the street to meet up with the local trail angel who's graciously putting me up for the night and shuttling me to the trail on her day off tomorrow. Super cool lady who's only on her second season of helping hikers, but comes across as someone who's been doing this her whole life - either way she's a lifetime of stories from only her first season! Quick breakfast tomorrow and off into the wild we'll drive. Have a quick post office stop to make, but otherwise this time tomorrow night I'll be sleeping on the desert floor under the stars. It's time for another walkabout, this time in the sunny state of Arizona. In a few days I'll be heading out west to walk the ~800 mile Arizona Trail (AZT). 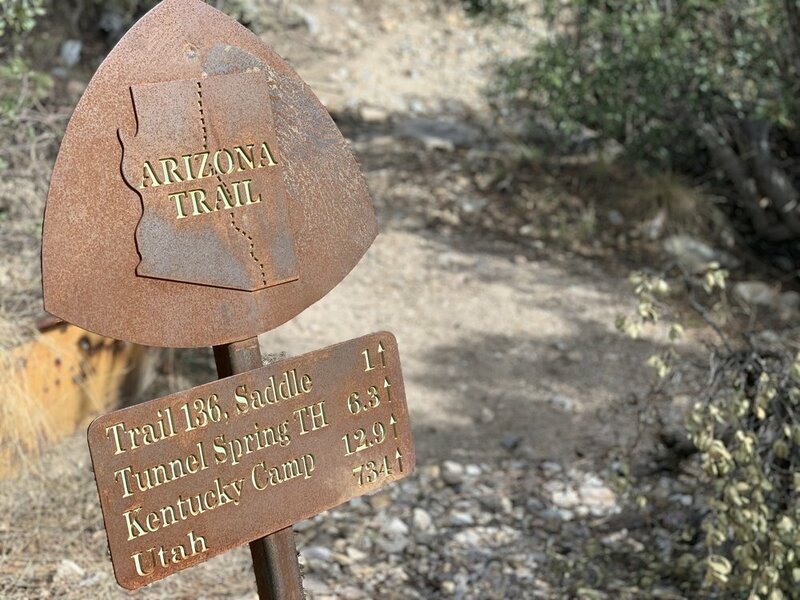 A kin to the Long Trail in Vermont and the Florida Trail, the AZT is designated as a National Scenic Trail, and runs the length of Arizona, terminating in the south at the Mexican border of Arizona, in the north at the border of Utah and Arizona. 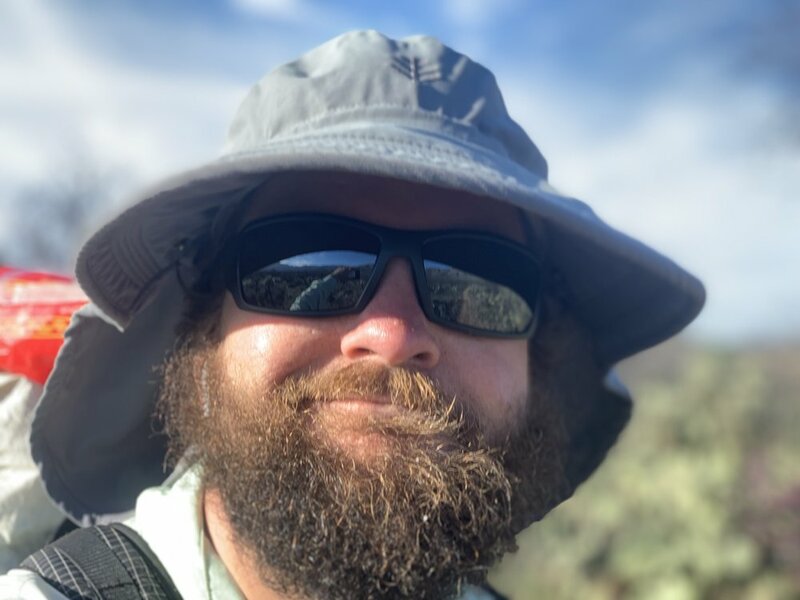 After experiencing the deserts of Southern California on the Pacific Crest Trail, I'm looking forward to another couple of weeks of the challenges of desert tramping. While I'm out I'll be writing daily, although posts may be delayed by a few days based on cellular and WiFi coverage. Worst case when I roll into town to resupply, I'll grab a coffee or two and batch upload the past couple of days all at once. Thanks for taking the time to read, I appreciate it and look forward to sharing another adventure with you all!